The Brown Sword Frog places your sword within easy reach while keeping your hands free. 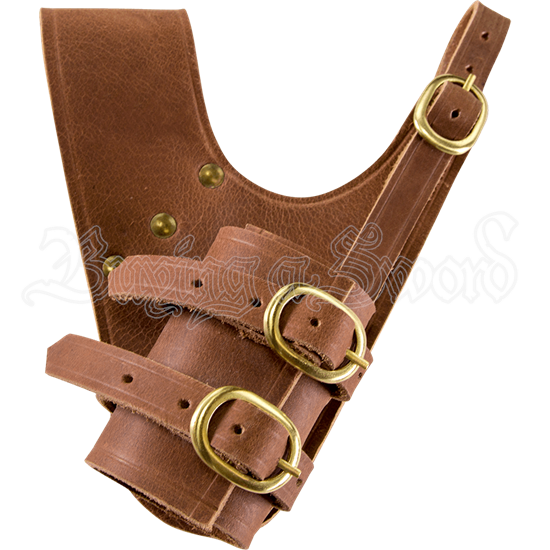 Secure your favorite LARP blade to your belt with this left handed leather sword frog. Its brass buckled straps ensure an adjustable fit. The thin front loop of this brown leather sword frog is adjustable and can be opened completely. The closed back loop is thicker and reinforced with brass studs, giving stability to the structure. Twin brass buckled straps adjust to hold tight the blade of your LARP sword. When held by the frog, the sword rests on the right side of the wearer, ready to be drawn with the left hand. With its versatile design and adjustable structure, this handcrafted LARP sword frog is perfect for any left-handed sword wielder.